Let's prepare your "special biggest bags" for a shopping season in the "Summer Clearance Sale" at AEON MALL Long Bien now! + Promotion in-stores: thousands of products and services with sale up to 50% ++ at the shops. 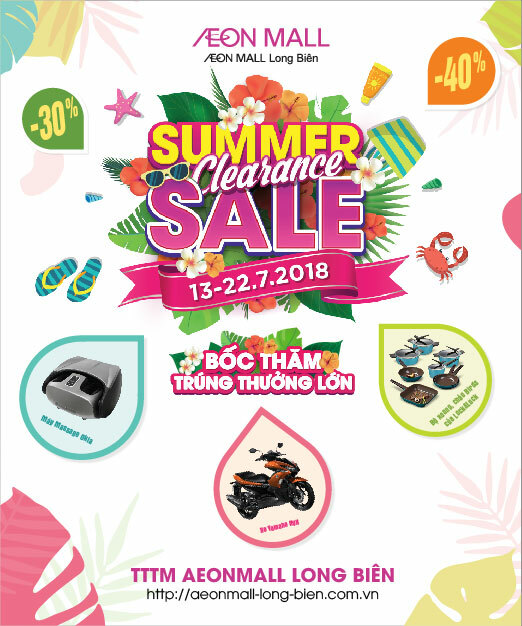 + Outlet Sale: coming to Central court, West court and public areas, you will be very overwhelmed with many amazing products, which will satisfied all the customers when visiting and shopping at AEON MALL Long Bien. + Lucky Draw: The lucky draw returns, gives customers the opportunity to shopping and get valuable gifts such as: Yamaha NXV, OKIA eTransformer foot massager and Lock&Lock Blue Birds with total value up to 100 million VND! There will also be another surprises for customers when visit, shopping and entertaining at AEON Long Bien during this event. Don’t forget to update all the information about the event in the coming time. AEON MALL Long Bien wishes you having an enjoyable shopping experience and see you at the “Summer Clearance Sale”!